In 2013 David Sefton’s theatre program for his first of four Adelaide Festivals was notable for its emphasis on the interactive and interdisciplinary. Belgian company Ontroerend’s immersive trilogy—The Smile Off Your Face, Internal and A Game Of You—came to define the program in the eyes of many, its intimacy challenging long-established expectations to do with the size and spectacle of the festival’s offerings. Although this year’s theatre program continued to lean heavily towards the Western canon, a marked return to scale was felt by this writer in Toneelgroep’s titanic Shakespearian anthology Roman Tragedies, the expansive arc of Windmill’s coming of age trilogy, and the vast historical-political sweeps of SKaGeN’s BigMouth and Stone/Castro’s Blackout. Coriolanus, Julius Caesar and Antony and Cleopatra are run consecutively, chronologically and without interval in Toneelgroep’s six-hour reimagining of Shakespeare’s trilogy of Roman histories. Director Ivo Van Hove has stripped away the poetry of the original plays and, with translator Tom Kleijn and dramaturgs Bart van den Eynde, Jan Peter Gerrits and Alexander Schreuder, pared the dialogue back to a crisp, utilitarian English (via surtitles translated from the original Dutch). Part television studio, part airport departure lounge, Jan Versweyveld’s set, which reaches deeply into the wings of the Festival Theatre, transforms Shakespeare’s mouldering halls of imperial power into a sort of drab, corporatised purgatory. 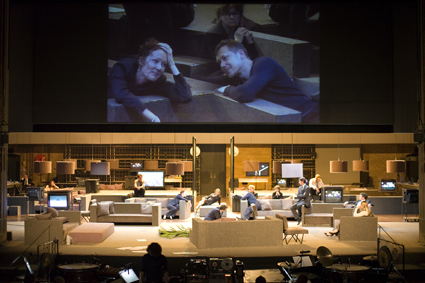 The stage, around which the audience are invited to more or less freely move after the first set change, is equipped with television screens running 24-hour news channels, computers on which audience members can tweet (‘Coriolanus just got banished from Rome. Damn. His Mum’s angry’) and two functioning snack bars. The contrast between the production’s sweep and duration and its emphasis on an individualistic, social media-informed experience is intriguing, simultaneously bloating and anatomising the drama. Witnessed from the auditorium, much of Coriolanus plays out like an unusually compelling press conference, but the view from the stage, despite the proximity of the performers, is fractured and unstable. The action is always partially obscured, either by elements of the set or other audience members, and the search for optimally readable surtitles among the dozen or so strategically arranged screens is sometimes frustrating. The audience is positioned as the denizens of this new, information-overloaded Rome, snatching at supposedly sense-making updates and relief-giving gossip as hungrily as the “rabble of plebeians” that sets the events of Coriolanus in motion does for corn. The plays’ numerous wars and annexations are familiarly distant, signified not by the movement of swords and armies but by sound and vision: pounding music and a news ticker. We could be watching Fox News on the eve of the Iraq War. Our contemporary impotence is given a freshly chilling dimension by the audience’s powerless proximity to Shakespeare’s ruling classes who, in Van Hove’s production, die as the politicians of our own times die—publicly and bloodlessly, arraigned, photographed and finally vanished for our grim pleasure. All three plays are distinguished by remarkable performances but, for me, Coriolanus most rewardingly benefited from Van Hove’s consummate ensemble, giving us Gijs Scholten van Aschat’s viciously anti-civil title character and Frieda Pittoors’ calculating but earthy Volumnia, Coriolanus’ mother. Their relationship is fascinating, a dynamic power play between intellectual equals that contains none of the camp or soft misogyny of previous interpretations. If the other two plays, with the exception of Hans Kesting’s Mark Antony whose tear-drenched eulogy for Caesar is a mid-show high point, are not as resoundingly successful, it may be because the unbroken, saturating tides of these histories begin to conflate, challenging the audience’s ability to fully engage with so much information. Roman Tragedies is, nevertheless, an almost wholly successful marriage of innovative design and gutsy, exacting performances which refreshes Shakespeare’s plays for an era marked by the escalating tension between our technology-powered connectedness and anxiety about our political emasculation in the face of increasingly hermetic state and corporate arrangements. Also offering a broad historical vista this festival, albeit on a radically reduced scale, was Belgian actor Valentijn Dhaenens in the one-man BigMouth. Dressed in nondescript business attire, Dhaenens uses whole or partial speeches to fashion a performative mashup in the guise of a lecture. The names of the original speakers are scrawled on a digitised blackboard and disappear each time Dhaenens progresses. The conceit is simple and consistent, disrupted only by tenuously linked period songs that are performed live and, notwithstanding the assistance of loops, a cappella. Taking in Ancient Greece and Rome (Pericles, Socrates, Cicero), Nazi-occupied Europe (Goebbels, Patton), colonial Africa (Lumumba) and post-9/11 America (George W Bush) the speeches cover vast geographical, historical and thematic terrain. What is less than clear is what ties these disparities together. Though skillfully performed by Dhaenens, who is bilingual and an impressive mimic in multiple languages, the lack of a binding schema reduces BigMouth’s impact. Moreover, not all of the speeches are great or even good; US conservative Ann Coulter’s is especially conspicuous, not only because it is the sole contribution by a woman but also because it is entirely unremarkable, an asinine anti-Muslim diatribe by a mediocre politician. There are discernible subtexts—the ebb and flow of democracy over time, racism and colonialism, what Samuel P Huntington and others have termed “The Clash of Civilisations”—but perhaps it is the omissions that do the most to prevent an intelligible through line. I wasn’t sure what to make of the absence of women, save Coulter, or why none of the speeches touched on the Cold War despite the predominance of 20th century material. At times, as when Dhaenens wickedly interweaves warmongering speeches by a blustering Patton and a frighteningly serene Goebbels, BigMouth seems close to forming a useful critique of oratorical power, but the production remained for this writer an unsatisfying and opaque experience. Having interviewed Portuguese theatremaker Paulo Castro, one half of Adelaide-based duo Stone/Castro, for RealTime 119 (p40), I was prepared to be confronted by Blackout, an interdisciplinary work for dancers and actors inspired by the September 11, 2001 terrorist attacks. Instead, I found the production to be a defiantly playful one, ironical and full of textual and choreographic eccentricity. A young couple, played by dancers Alisdair Macindoe and Larissa McGowan, is to be married on a sailboat amid a disparate group of guests which includes the groom’s father (Stephen Sheehan), a kurta–wearing bohemian, the mysterious Portuguese best man (John Romao) and a wannabe rock ‘n’ roller (Nathan O’Keefe). A series of unexplained power cuts throws the wedding into a state of chaos as each of the guests attempts to make a speech in praise of the increasingly estranged bride and groom. Castro’s text, translated from Portuguese into English by Joao Vaz, is sharp and funny, full of bitterly satirical takedowns of middle class pretensions. Conversely, some of the jokes—such as O’Keefe’s character’s inability to stop talking long enough to perform his song “Shandy”—are stretched well beyond tolerability, and the surrealness of speeches by the bride (on aliens) and Charlotte Rose’s waitress (on the killing of her ex-lover’s dog) are vexing. In Blackout’s final moments the best man, having stripped to his waist and partially cross-dressed, assumes a Christ-like posture as water laps at his outstretched arms and legs, the rest of the guests having presumably made it to safety. Daniel Worm’s precise lighting ensures the image, like many others in the play, is striking, but its significance is obscure, as is its relationship to the rest of a production which up until that point has been predicated on skewering rather than indulging in high-flown posturing. With its late 70s aesthetic, disco- and hair rock-mining soundtrack, and nods to Jim Henson’s Labyrinth, Girl Asleep digs deeply into Generation X nostalgia to produce a brash, filmic and spikily postmodern take on the transition from female adolescence to womanhood. 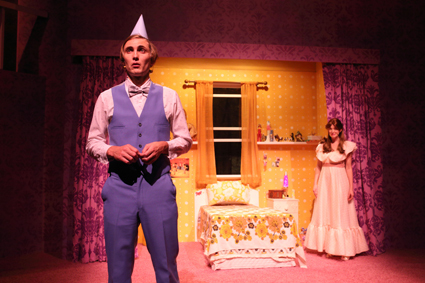 It is one of three stylistically consistent plays penned by Matthew Whittet for South Australian children’s theatre company Windmill which, together with Fugitive (2014) and School Dance (2012), form a coming of age trilogy, performed together for the first time during the festival at the invitation of David Sefton. Girl Asleep’s 14-year-old heroine, Greta (Ellen Steele), is, like most of the trilogy’s protagonists, an unfashionable teenager on the undesired cusp of adulthood. In a subtle recasting of the trope of the older, wiser sibling who assists the younger in navigating the transition, Greta’s sister (Jude Henshall) cautions her not to fall asleep during the birthday party her parents (Matthew Whittet and Amber McMahon) have unwelcomely organised for her. Greta, of course, falls asleep and her burgeoning sexuality becomes the subtext of a series of bizarre, sometimes scary and often funny encounters with fantastical humans and subhumans including a witch, a goblin and a younger version of herself. Girl Asleep’s cross-generational appeal is built on various fronts: its unguarded appropriation of familiar fairy tale tropes, its knowingly silly pop culture grabs and its conventions—faux slow motion action sequences, exaggerated light and sound effects—which both mock and pay homage to contemporary children’s cinema. If Girl Asleep’s mawkish ending errs a little too much on the side of homage in its kid glove treatment of Greta’s sexual awakening, the young adults sitting either side of me did not appear to notice.